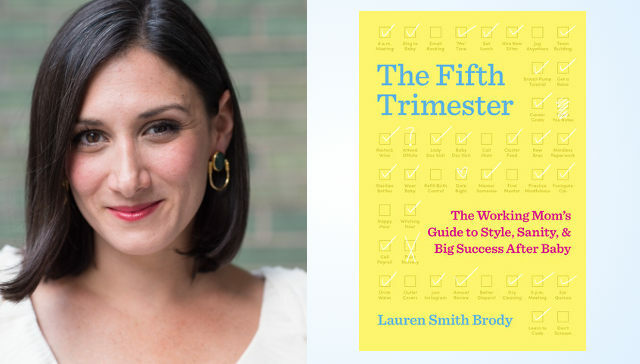 Lauren Smith Brody is a writer, producer, consultant, speaker, and the author of The Fifth Trimester (Doubleday, April 2017). She was recently featured on Good Morning America with her tips for returning to work after having a baby. Prior to launching T5T, Lauren had a 16-year career in magazine publishing, most recently as the longtime executive editor of Glamour magazine at Condé Nast, overseeing the magazine’s features, beauty, and fashion content, as well as brand and digital extensions and editorial events, including Glamour’s annual Women of the Year awards. As both an executive-level manager and a content expert, she helped colleagues and 12 million monthly readers through career and life transitions with empathy and vital information. Raised in Ohio, Texas, and Georgia, she now lives in New York City with her husband and two young sons. 1MFWF: As a mom of three kids myself, I just wish this book had come out in 2010 when my first child was born! So many of the issues you broach are exactly the conversations I’ve had with so many women! Let’s start with the: “I want to quit attack”—which will probably be recognizable to any new working mom. Was there a common thread on this among the seven hundred plus women you interviewed? What’s your best advice now? Lauren: There’s so much about this work that was an education for me, in spite of having been through the transition myself after the birth of each of my two sons. One thing I learned very early on is that just as women have a diversity of backgrounds and financial circumstances, there’s an astounding diversity to our ambition levels too. I talked to plenty of lean-inners but also to many women—at all levels of seniority—who admitted that they weren’t all that upwardly-bound in their careers, or that they experienced a temporary but major shift downward in their ambition after having a baby. In many cases it was easy to see that that more support and more paid time off could have made all the difference. Nearly everyone admitted having at least a fleeting moment of “I have to quit,”—no matter their ambition level. I decided to dig into the science of what gets you through that kind of feeling. The best thing you can do for yourself is make two lists: one is what you get out of your job, and the second is what your job gets out of you. Seeing those lists clearly has been show to help with focus (a major challenge during the Fifth Trimester) and to help your feel more comfortable with the compromises you make during your day. And we ALL make compromises! 1MFWF: Once we get past the not quitting work part, what did you learn both personally and from your interviews about flexible work preferences? Anything counterintuitive or surprising? Lauren: I interviewed a Millennial workplace expert who told me that one thing she always tells the Baby Boomer and GenX managers who bring her in is that they MUST wrap their heads around the idea that the younger generation will be engaged in their personal lives (on social media, or just ordering their groceries online) during the so-called workday. Then she tells them that if they expect those same employees to be answering emails at 10 o’clock at night (which of course they do), they MUST be okay with that. That personal/work gray area was really born out in my interviewing. Of course people were working during “off” hours and tending to personal stuff during 9 to 5, but what I loved learning also was that the gray area is really more of a shiny, beautiful silver. It can be a great thing. Moms who got comfortable with the swirl of it all described finding new meaning in their work because they brought so much heart to it. And in their family lives, they learned it was okay to lean on some of the more worky organizational skills. I don’t even really use the term “work life balance” anymore because a good life includes work, and good work draws on life. They aren’t two opposing forces. 1MFWF: What is the best way to ask for flexible work? What about other workers who aren’t parents feeling it’s an unfair “perk” for parents? 1) When asking for flexible work, do not present your request as if you’re asking for an accommodation. Your boss is going to be starting from a point of feeling like something’s been taken away. Instead, think about how what you’re asking for can be mutually beneficial. How does it help your company to have you working different hours or different duties? If you can’t answer that question, do some more creative thinking (and legitimizing) before you make the approach. 2) In my research, I found that the push/pull between parents and non-parents goes both ways. We may think, as moms, that our childless colleagues resent us. But in truth, we parents make a lot of unfair assumptions about their lives, too. The great equalizer is simply to realize that everyone has a personal life. Every colleague in your workplace has something that is as important to him or her as your baby is to you. It’s that simple. And if you can show that you respect that as you come back from leave, you will level the playing field. Pregnancy might be the most visible personal life need in the workplace, but everyone has a personal life, and if the cultural changes you help make to support your family life benefit everyone else’s lives too, that’s a great thing. 1MFWF: What about hourly workers who might not have the same options that other professional do when it comes to flexible work? Lauren: I heard stories from police officers and waitresses and even farm factory workers who struggled—largely because they simply couldn’t take as much unpaid time away from work. The women described relying on camaraderie in the workplace—bathrooms shared for pumping, shifts covered, that kind of thing. It was sobering and definitely helped me become aware of my own privilege as I did my interviewing. 1MFWF: It seems like this is all incremental change person by person, company by company. How can we better advocate for and create change around flexible work (and other policies) that would help women thrive in the fifth trimester? Lauren: Yes, yes, that’s exactly it. I want American women to know how to ask for policy changes or how to stay in, move up, and make them from a position of management themselves. We need that! But I also really want new moms who are struggling to understand that that struggle serves a purpose. If they are transparent about the challenges of new working parenthood—if they ask to move the early-morning meeting, or talk about being sleep deprived but still THERE, or pump while on a conference call—that moves the needle on our big workplace culture problem too. These moms are paying it forward. And it WILL pay off. To specifically answer your question, I think that as forward-thinking private companies change their parental leave policies, they need to look at the return-to-work period too, and make equally important changes there. Melanie Kaye is a communications strategist and writer for 1MFWF. She is the former Director of Communications to Dr. Jill Biden and, a Wisconsin native, also served as press secretary to former Governor Jim Doyle. She is a co-author of The Complete Idiot’s Guide to American Government and was a reporter covering politics and government for The Hill newspaper in Washington, D.C., The Green Bay News-Chronicle, and the political news service WisPolitics.com.